Digital Marshall Stability Test Apparatus for Bitumen Testing - This versatile digital loading frame features a microprocessor controlled drive system with stepper motor enabling the operator to easily set any test speed by digital switches. The machine is fitted with an RS 232 C port so it can be remotely controlled by a personal computer. The upper and lower limits of platen travel are set by use of automatic safety cutout switches. All load rings, dial gauges, cells, etc. have to be ordered separately. Specification : - Load capacity : 50kN (5000 kgf) - Platen Speeds : Selectable Speed range 0.01 mm to 62mm/min - Accuracy of platen speed : 1% - Max. vertical daylight : 0-850 mm - Platen dia : 180mm - Distance between columns : 380mm - RS 232 Port for connection to personal computer. L.V.D.T. 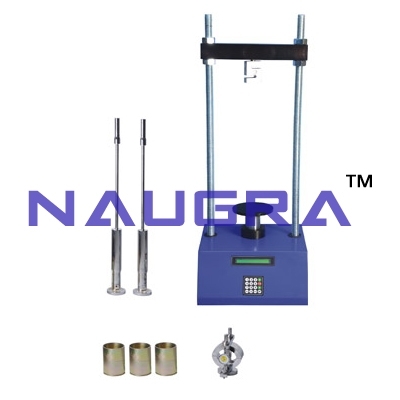 can be supplied instead of dial gauge fitted with Breaking Head Assembly..
We are leading manufacturers, suppliers & exporters of Digital Marshall Stability Test Apparatus For Testing Lab for Bitumen Testing Lab. Contact us to get high quality designed Digital Marshall Stability Test Apparatus For Testing Lab for Bitumen Testing Lab for schools, colleges, universities, research labs, laboratories and various industries. We accept bulk orders for government tenders in all countries around the globe. For similar products visit at main page of Bitumen Testing Lab Equipments.